From 1945 to the early 1970s, technological innovations helped to transform American agriculture. The introduction of industrial chemicals and new machinery to US farm operations in the decades after the Second World War ushered in, what some historians have characterized as an agricultural revolution. These changes certainly altered food production and agricultural output. They also altered the practice of farming itself, leading ultimately to fewer farmers tending larger and larger farms. What caused farmers to adopt these new chemical and mechanical technologies? How did this affect the business of farming in the second half of the twentieth century? What were the environmental and human health consequences of these substantial changes in agriculture? On this episode of Nature’s Past, Joe Anderson joins us to discuss his book Industrializing the Corn Belt: Agriculture, Technology, and Environment, 1945-1972, a detailed study of the adoption of industrial chemical and mechanical technologies on US farms in the decades following the Second World War. Also, Jim Clifford discusses his new role as Project Coordinator for the Network in Canadian History and Environment. Please be sure to take a moment and review this podcast on our iTunes page. J.L. 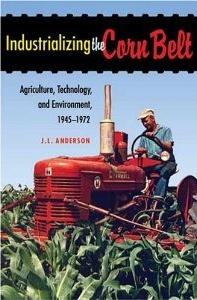 Anderson, Industrializing the Corn Belt: Agriculture, Technology, and Environment, 1945-1972. DeKalb, Ill.: Northern Illinois University Press, 2009.